Congratulations to the LCCS Choir! 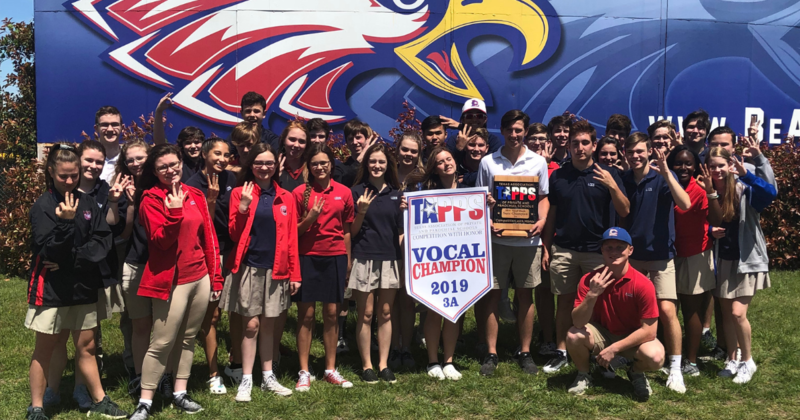 Our point total of 658 at the TAPPS state competitions was 100 more than last year and earned our choir the 2019 TAPPS 3A Vocal Music State Championship! We are so proud of this group for their outstanding achievement and keeping the state title at LCCS for the third year in a row! The choir received 13 ‘1’ Superior ratings, 10 ‘2’ Excellent ratings, and left in first place for TAPPS 3A schools going into the Large Ensemble Championship! Lady Eagle Choir received a 1 rating from all 3 judges! This was the first time since at least the early 2000’s! Male Eagle Choir received a 1 on their songs, and a 1 on their sight reading which combined means they earned a Sweepstakes for the 3rd year in a row! Eagle Choir received a 2 for their 3 songs. Congratulations again to all our choir students and staff on another great year!